David Thorne is serving a life sentence without the possibility of parole for allegedly hiring an acquaintance to kill the mother of his son, however, he never hired anyone nor did the acquaintance do the crime. Sometime between the evening hours on March 31, 1999 and 12:00 p.m. on April 1, 1999, Yvonne Layne, a mother of 5, was murdered in her home with one solid and steady slit to her throat. David Thorne was convicted of complicity to aggravated murder/murder for hire on January 25, 2000 by a 12 person jury. The police investigating the crime had tunnel vision throughout their investigation, narrowing in on David from the beginning. The investigators were unable to get David to confess, so instead they went after his acquaintance, Joseph Wilkes, who was barely 18 years of age and a high school dropout. After a lengthy interrogation, during which they told Joseph that David was “next door ratting him out”, he confessed, utilizing the story that the police had fed to him to what the police were telling him happened. Joe took a plea deal and David went to trial. Despite the lack of physical evidence of either Joe or David being at the scene and a poor police investigation, with very weak circumstantial evidence, an innocent man was convicted. Aaron Finley was wrongly convicted of murder on the accusation of the true killer, bribed with a reduced sentence, and a very dubious identification that placed him in a car with the killer before the murder. The indictments of the killer and Aaron do not agree on the cause of death, and Steven Hayne’s autopsy report was not entered as evidence. Aaron also had an alibi which could have been confirmed by the prosecution based on a laundry ticket. Aaron Finley was was indicted on April 12, 1996 and later convicted for the November 16, 1994 murder of George Monsour, during the commission of an armed robbery, and sentenced to life imprisonment without the possibility of early release. On November 16, 1994, Willie Davis went to the home of George Monsour, the victim, and pretended to be interested in purchasing Monsour’s car, an antique Chevrolet Impala. Davis agreed to purchase the car for $1,800.00 and he left to supposedly get the money. He returned to the Monsour home and Mr. Monsour went with Davis for a test drive. They left the Monsour home between 11:00 and 12:00. Monsour’s body was found in Warren Lake in Lauderdale County in the early hours of November 17, 1994. Willie Davis confessed to the crime and led the police to the body. At the crime scene, the police found many personal items of Monsour’s scattered around the site of the murder. Willie Davis testified against Aaron at trial. Davis alleged that he and Finley drove Monsour to Warren Lake, that while they were driving down the interstate, he and Aaron stopped to switch who was driving the car. That at this time, while they were outside of the car and out of Monsour’s hearing range, that they decided to rob Monsour. That Finley parked the car at Hillcrest and eventually forced Monsour by gunpoint down to Warren Lake. That it was at this point that Finley beat, kicked and eventually drowned Monsour. That he (Davis) took Mr. Monsour’s wallet while Finley was holding Monsour’s head under the water. 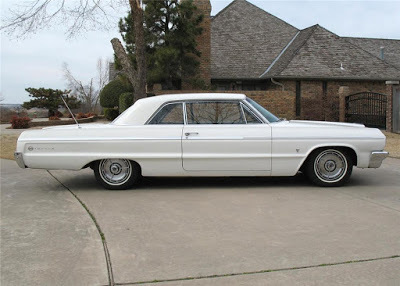 Rita Crane, a sister of one of the investigating officers, testified that she saw the Impala with Monsour and three black males on Interstate 20 on November 16, 1994, around noon. She identified Davis as the driver of the vehicle and Finley as one of the passengers in the vehicle. She further testified that she knew Monsour but did not realize at the time that he was in the vehicle. Aaron Finley and Stacey Armstrong (Davis’ cousin) were released in 1995 after not being indicted three times due to lack of evidence, but Willie Davis remained incarcerated and was convicted of the murder of George Monsour. However in April of 1996 Aaron Finley was indicted for capital murder. Willie Davis had made a deal with the district Attorney to testify against Aaron Finley to have his sentence be life in prison instead of the death penalty. 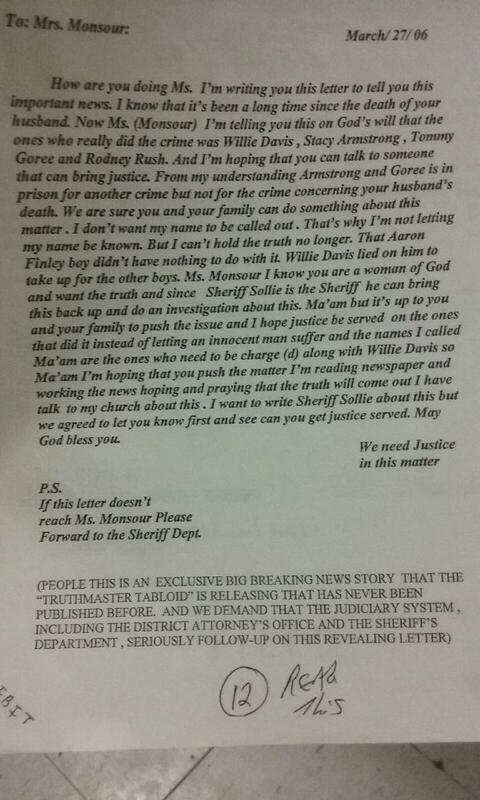 Willie Davis’s testimony and statements changed numerous times, and is not credible. It’s implausible that Rita Crane could have identified Aaron in the Impala on Interstate 20 around noon. Aaron, who was age 20 at the time, told detectives that on that morning of the murder he went to Perfection Cleaners to leave some clothes to be cleaned, there was a ticket made out which would have been in the possession of the cleaners, however this this was not available at trial to corroborate his alibi. The owner of Perfection Cleaners called the detective and told him he found the records concerning the date and time Aaron dropped his clothes off but no one ever came to pick the records up. Aaron does not deny that he was in the car later that day, in the evening, and this is how he came to be a suspect. There was no forensic evidence at the scene to link Aaron to the murder, only the testimony of Davis and the very doubtful sighting by Rita Crane. Furthermore, Rita Crane’s testimony was inconsistent and contradictory to statements she had made before and during trial ( see appeal ruling ). Aaron has been supported by the Mississipi Justice Project. Some documents are available here. In particular, the indictments do not agree on the how the victim died. Aaron’s indictment says “drowning”, but Davis’ indictment says “beating and shooting”. In addition, there is a reply to a request for the autopsy report which claims it is not a public record. Also, a mysterious anonymous letter dated 27 March, 2006, claiming the crime was committed by Willie Davis and three others. Willard O’Neal, 48, was convicted in 2004 of one count of first-degree murder and one count of shooting with intent to kill and sentenced to life in prison without the possibility of parole. Bruce Chamberlain was killed on December 23, 2001 outside his bar, the Trapeze Lounge and Gildardo Rueda was injured. “My client had an alibi at the exact time the crime was taking place and the DNA evidence at the scene was not attributable to Mr. O’Neal,” said Christina Green, O’Neal’s attorney and interim legal director at the Oklahoma Innocence Project. Matthew Riley was convicted in October 2013 of the December 9, 2008 murder of his parents, Linda and Steven Riley in Sacramento, California, and was sentenced to life with no possibility of parole. The murder occurred early in the morning, in the afternoon Matthew discovered the bodies and called 911. From that moment he was the only target of the investigation, despite the fact that his family tried to get the police to consider other suspects. Matthew had no reason to murder his own parents. Unidentified DNA extracted from blood was found at the scene, and also unidentified finger-prints. There was no forensic evidence linking him to the crime, however his wife Jannilin Overton testified that he left home that night. Overton, a meth addict, was not a credible witness, and her story changed several times. Overton testified that Matthew left their apartment around 3am. Matthew’s parents home, where they were murdered, was 40 miles from Matthew’s apartment. If he went out in the middle of the night at 3am intent on murdering his parents, he would have been at the scene around 4am. The prosecution’s time of death seems incompatible with evidence found at the scene which suggests Matthew’s parents were attacked after Steven had made coffee. The morning routine was that Steven got up first and drank coffee while reading the paper. Then he brought Linda breakfast upstairs on a tray. When they were killed, the coffee pot was half-full and the breakfast tray was still downstairs. Security cameras showed a newspaper delivery car at 6:30am. This suggests the attack happened after 6:30am. Around 7:00 a.m., Matt made a purchase in a doughnut shop near his home, which was verified by a time-stamped receipt. If he murdered his parents, he would have been covered in blood, no trace was found in his car, there is no place or time for him to have cleaned up, driven back before buying the doughnut. At the sentencing hearing, the judge said Matthew staged a fake ransacking of the residence but made the mistake of leaving valuables normally taken by a thief. The judge said “They were horrific assaults and during many trials over 22 years as a judge, the savage nature of the attacks showed that it would have to be a crazy person, serial killer or some connection – it would have to be someone close to them”. The judge added that Riley’s guilty demeanor after his parent’s death was an important factor in the case, “He was dispassionate – almost matter of fact”. Family members, including Matthew’s Aunt, and the brother of victim Linda Riley, believe that Matthew was wrongly convicted. A possible alternate suspect would be Edward Wayne Edwards. Matt Sopron was implicated in a double murder nine months after the crime by the true perpetrators who were looking to avoid a death sentence. There was no physical evidence linking him to the crime, and the witnesses implicating him all told different stories. Defense witnesses contradicted their testimony. After trial, two prosecution witnesses recanted and related how they were coerced into giving false evidence, transcripts are available here. Matt was asleep at home when the crime took place, and he had no knowledge of it. After serving 20 years of a life sentence, Matthew Sopron walked out of Stateville Prison Tuesday afternoon a free man — just hours after Cook County prosecutors dropped murder charges against him after witnesses admitted to lying on the stand during his trial. Earlier, Sopron, 45, had smiled as he walked past a courtroom gallery overflowing with supporters Tuesday morning. Gasps and sniffling filled the room as Assistant State’s Attorney Carol Rogala asked Judge Timothy Joyce to vacate Sopron’s conviction for a 1995 gang shooting that killed two eighth-grade girls. Brian Peixoto was wrongfully convicted in 1996 for the murder of his girlfriend’s 3-year-old son Christopher Affonso, Jr., and sentenced to life in prison in Massachusetts. Peixoto’s supporters state that the child died from injuries sustained during a fall, not from child abuse, and they have four nationally and internationally recognized medical experts that support their claims. New expert evidence proves Brian’s innocence. Lincoln Keith was arrested in 1984 and convicted of murder-for-hire based on coerced testimony from the killer and another defendant in exchange for leniency. The State claimed the victim’s granddaughter offered him $400 , but she was acquitted. The State claimed he “blurted out” a confession with many people present, that only one detective heard, Snow Robertson. The bullet and casing recovered did not match Keith’s gun. One juror was a family friend of detective Robertson. He had an alibi, but the witness was not called at trial. This case is included to show just how ridiculous wrongful convictions can be. Wilson was convicted of murdering his wife after she left and some old bones were found in a cave in 1912. Luckily his wife turned up alive and well after he was convicted. In 1932, Yale’s Borchard included Bill Wilson’s story in his book “Convicting the Innocent,” an examination of 65 wrongful convictions in America. A California man who was freed after serving 34 years of a life sentence for murder had the charges formally dismissed Wednesday. Michael Hanline, 69, was the longest-serving wrongfully incarcerated inmate in California history, according to the California Innocence Project, whose lawyers worked for 15 years to free him and persuaded prosecutors to re-examine the evidence. Testing showed DNA found at the crime scene did not come from Hanline or his alleged accomplice. In addition, prosecutors withheld evidence that should have been disclosed to Hanline’s legal team during the trial. Christy was convicted as a juvenile and has been imprisoned for 13 years. She was arrested and detained two months after she had turned 15 years old. During her 48-hour detention, the police denied her contact with her mother, a lawyer, food, and water. She did not sleep during this time. She was coerced into making a false confession. Aged 16, she was tried in an adult court, and sentenced to two life sentences for a crime she did not commit. Featured Case #41: John Horton was wrongly convicted of murder in 1995. His cousin subsequently confessed to the crime. The case is supported by the Center of Wrongful Convictions of Youth at Northwestern University School of Law. 10 February 2016 : Released on Bond. Judge Joseph G. McGraw set his bond at $50,000.